We are one of the most popular INFINITI dealers in Williamsville, NY. We have a great selection of new and used vehicles. You can order parts or schedule a service appointment online. Visit our Williamsville dealership and test-drive the Q50 Sedan or QX50 Crossover. We also invite you to test-drive the award winning Q60 Coupe. We have always been committed to providing a fantastic experience to our customers. That has made us a preferred dealership in the area. When searching for a reliable service center, consider INFINITI of Williamsville. Our technicians have been handling these vehicles for years and know them well. We also have a part store that has quality products for your SUV, crossover, coupe or sedan. Not only Williamsville, but those from surrounding areas also bring their vehicle to us. If you are short on time and are unable to visit us, you can schedule a servicing appointment or order parts online. 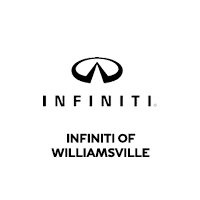 We look forward to assisting you at our Williamsville INFINITI dealership.